Combining cutting-edge performance technology with near-hedonistic luxury, Assos presents their Men’s tiburuKnickersMille_S7: calf-length bib tights that yield outstanding efficacy and physical ease. The legs feature Assos’ 3D RX Medium fabric — thermal, breathable, abrasion resistant, and fleecy with a water repellent treatment — ideal for the cool and damp conditions of fall, early winter, and spring. Born out of Assos’ comfortFit line, these knickers embody numerous comfort-oriented features such as wider set bib straps, a narrower yoke, and an updated paneling system. 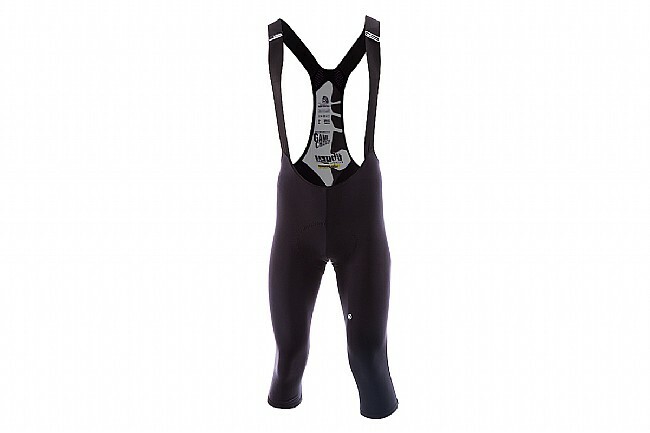 Furnished with one of Assos’ top-line chamois, these knickers deliver comprehensive anatomic support. The mille_S7 insert consists of 8mm of layered memory foam with ASSOS waffle technology - perforations that facilitate ventilation, moisture wicking, and lightness, and patented ASSOS goldenGate technology that helps the chamois move with the rider’s body for drastically diminished friction and irritation. Mille_S7 chamois with ASSOS waffle and goldenGate.